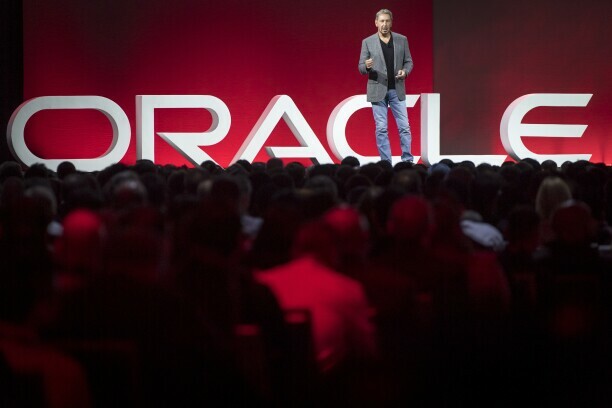 Larry Ellison, co-founder and executive chairman of Oracle Corp., speaks during the Oracle OpenWorld 2018 conference in San Francisco, California, U.S., on Monday, Oct. 22, 2018. New York City's chief financial officer has called for the SEC to investigate the company over pay bias allegations. The overseer of New York City’s pension funds is urging the Securities and Exchange Commission to investigate whether Oracle Corp. misled investors about alleged pay bias across its workforce. The SEC didn’t immediately return a request for comment. Oracle and the Labor Department, which filed the hiring and pay discrimination lawsuit in January 2017, declined to comment. Oracle tried to dismiss the case, but the request was denied Jan. 16. The company is also being sued by former employees, who allege pay discrimination among female engineers at Oracle’s Redwood City, Calif. headquarters. “Like a lot of other Silicon Valley companies, investors are increasingly concerned about Oracle’s gender record,” said Julie Gorte, senior vice president for sustainable investing at Pax World Funds. Pax, a mutual fund, submitted the shareholder proposal on gender pay gaps at Oracle. Nearly 40 percent of voting shares backed the proposal at Oracle’s Nov. 14 meeting.